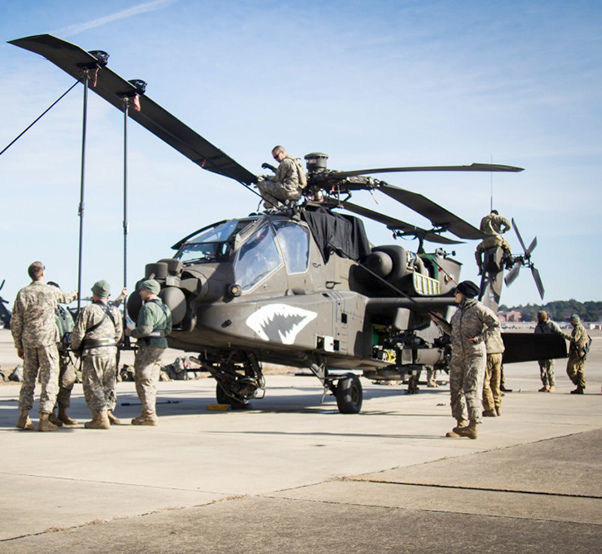 Soldiers assigned to 1st Attack Reconnaissance Battalion, 82nd Combat Aviation Brigade unfold the main rotor blades of an AH-64D Apache helicopter as part of the 82nd Airborne Division’s deployment readiness exercise on Fort Bragg, N.C., Jan. 09, 2017. 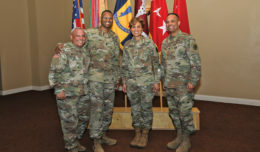 Both the CAB and the U.S. Army Forces Command G-2 section were recognized for their Lean Six Sigma initiatives during the exercise. Saving millions of dollars, the recipients of this year’s Lean Six Sigma excellence awards reduced processing times, improved health of the force and increased readiness. “We are here to recognize some very extraordinary organizations and extraordinary individuals for the work they have done,” Schneider said to the audience. 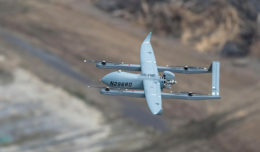 The money saved by the 11 organizations and their 13 initiatives can be “ploughed into war readiness,” Schneider said. He stressed that in order to pay for readiness, the military must reform the way it does business. “We want people to think the way these people thought and do what these people did,” Schneider said of the recipients who used Lean Six Sigma principles and practices to adopt new ways of doing business and streamlining processes. 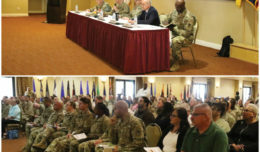 “The Army makes a conscious effort to analyze and improve the processes that undergird our core mission to fight and win our nation’s wars,” said Dr. Charles Brandon, director of the Continuous Process Improvement Office within the Army’s Office of Business Transformation. Eliminating billions of dollars in waste and delivering readiness at best value makes us Army Strong,” Brandon said. The 21st Theater Sustainment Command, U.S. Army Europe successfully transformed its Lean Six Sigma program with greater emphasis on commander involvement and introduced several problem-solving tools. For fiscal 2016, the projects resulted in an estimated net financial benefit of $2.9 million. “We spent many hours trying to figure out how we could reach more civilians, more veterans and retirees,” said Staff Sgt. Daniel Young, who accepted the award for the team. He pointed out that the office is now reaching nearly three times the audience it did just a year ago. The 21st Theater Sustainment Command, U.S. Army Europe improved accuracy in personnel tempo reporting from 0.75 percent to 60 percent for unit readiness, resulting in a net cost avoidance estimate of $703,000 for fiscal years 2016 to 2022. Recipients of Lean Six Sigma excellence awards from 11 organizations across the Army pose after being recognized by Karl Schneider (center), the senior career official performing the duties of the under secretary of the Army and Lt. Gen. Edward C. Cardon, director of the Office of Business Transformation, May 18, 2017. Landstuhl Regional Medical Center, Regional Health Command–Europe, U.S. Army Medical Command improved the screening time for patients with traumatic brain injury by 50 percent, decreasing the wait time for Soldiers to be evaluated. “Anything we can do that frees up time to allow Soldiers to conduct training is significant for Army readiness,” said FORSCOM G-8’s Steven Sawicki, a Master Black Belt specialist with the Business and Readiness Improvement Division. For example, the 82nd Airborne Division conducted its Deployment Readiness Exercise in January 2017. About two months before that exercise began, FORSCOM and the 82nd Airborne Division’s Operations Research and Systems Analysis, or ORSA, and Lean Six Sigma team began planning. They ultimately had 12 to 15 people located at sites during the training exercise to collect over 40,000 data points — particularly studying six nodes of exercise activities. U.S. Army Tank-automotive and Armaments Command — Integrated Logistics Support Center, U.S. Army Materiel Command produced an automated process for updating 90 percent of an interactive electronic technical manual in eight hours. The old process used an average of 2,500 hours of manual labor. The initiative will generate an estimated net financial benefit of $16.4 million for FYs 2016 to 2018. U.S. Army Communications-Electronics Command, Tobyhanna Army Depot, U.S. Army Materiel Command, reduced labor hours for Joint Precision Air Drop, or JPAD systems from 28.9 hours to 17.6 hours, thereby generating an estimated net savings of $1.1 million for fiscal 2016 to 2017. The Great Lakes and Rivers Division, Nashville District, U.S. Army Corps of Engineers reduced its contracting office labor burden from 45 hours to 25 minutes per supply order and acquisition costs from $4,365 to $41 through using a Defense Logistics Agency program. The project enabled contract specialists to focus on more complex procurements, resulting in an estimated net cost avoidance of $1.7 million for fiscal 2016 to 2020. This was the first LEAP award received by the Army Corps of Engineers’ Nashville District, officials said. The district implemented a pilot program to use the Defense Logistics Agency’s Facilities Maintenance, Repair Operations Program to purchase supply items faster and save funds. The items ranged from crane cables to air winches, remote switches and sump pumps. “Purchasing simple supply items (this way) typically also reduces procurement lead time, resulting in the receipt of supplies, material and equipment significantly faster,” said Tim Dunn, deputy chief of the Operations Division for the U.S. Army Corps of Engineers Nashville District.